Re: Salient Assassinations In History [TPA3]91/? chapcrap wrote: This tournament has a little over a week to be FULL. Re: Salient Assassinations In History [TPA3]100/? Player list has been updated. We have exactly 100 people. Next multiple of 6 is 102, so let's see if we can get a couple more in here, plus a couple of reserves. Tripitaka is in! That's always a good sign! Only you could tempt me back in here, after months of detoxing from tourneys! PrincipalFoe wrote: I will play. And we are finally FULL. Re: Salient Assassinations In History [TPA3] FULL!!! Several things in this text are worthy of reflection. First, the Lord says, “I will put a spirit in him, and he shall hear news.” The expression is shrouded in mystery. Was it the report of an approaching Egyptian force (vv. 8-9) whom the Lord might have stirred? Or the stunning news of the destruction of his army at Jerusalem? (19:35-36). Most likely the latter. The declaration that God would be orchestrating the message is clear (cf. Acts 17:26). Sennacherib’s arrogance would be replaced with a paralysis of fear! Second, there is the prophecy that he would return to his own land. The ruler did go home presently. Significant, however, is the fact that while he engaged in a number of subsequent military campaigns, he never again returned to Judah! Why not? Finally, Jehovah declared: “I will cause him to fall by the sword in his own land.” This amazing prophecy was fulfilled precisely—some twenty years later. As one scholar has noted: “The mills of God grind slowly but exceedingly fine” (Patterson 1988, 268). So Sennacherib king of Assyria departed, and went and returned, and dwelt at Nineveh. And it came to pass, as he was worshipping in the house of Nisroch his god, that Adrammelech and Sharezer [two sons] smote him with the sword: and they escaped into the land of Ararat. And Esar-haddon his son reigned in his stead (2 Kings 19:36-37). In the month of Nisan . . . I made my joyful entrance into the royal palace, the awesome place wherein abides the fate of kings. A firm determination fell upon my brothers. They forsook the gods and returned to their deeds of violence, plotting evil . . . . They revolted. To gain the kingship they slew Sennacherib, their father" (Caiger 1944, 161-162). Sennacherib reign marked the beginning of the final spectacular century of the Assyrian Empire. His murder and replacement by Esarhaddon resulted in the rebuilding of Babylon and the moving of the capitol there. Hey there -- if you still think you might need reserves, I'd be more than happy to register! rjhankey wrote: Hey there -- if you still think you might need reserves, I'd be more than happy to register! In the spring of 336 BC, Philip begun the invasion of Persia. He sent generals Attalus and Parmenio with an advance force of 10,000 Macedonian troops, to cross over into Asia Minor and pave the way for the later advance of the main army. And while the Macedonians were crossing the Hellespont, in Macedonia everything was ready for the grand celebration for the wedding of Philip's daughter Cleopatra to prince Alexander of Epirus, brother of Olympias. The first day of the celebrations the guests saw a lavish entertained of every sort. But on the second day of the celebration, while entering the theater passing between his son Alexander and his new son-in-law Alexander, Philip was struck with a dagger and killed on the spot. The assassin Pausanias, a young Macedonian noble, attempted to escape but tripped and was killed on the spot by few close friends of Philip's son Alexander. 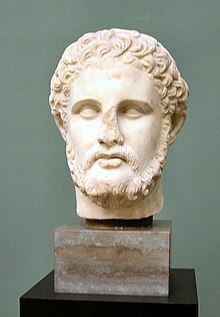 The great Macedonian conqueror was dead, the men who liberated his country from foreign occupation and brought if from the edge of the abyss into a world power. His dream for conquering the Persian Empire now lays on his successor, his son king Alexander III. But both ancient and modern historians recognize that without the military and political efforts of Philip, Alexander would have never been as successful as he was. After all, it was Philip who created the powerful Macedonian army and turned Macedonia into a strong nation in arms. Meanwhile, kill one of your 21st Century friends while you ponder history! Second week games have been created and invitations sent out. Johnsonea and Prince Jazbo have missed their first invite in week 2. Re-sent. I managed to stay awake long enough to make this week's games and send out invites. I'm simply too damn tired to actually check scores. Sorry, but it's been a hard week. Anyway, play and enjoy, and this tourney will be my first priority for updating either next weekend or even midweek if I get a day off work. Two players have been eliminated: 4 red who killed the wrong target in his first complete game, and johnsonea who deadbeated out of two different games. Week 4 games have been created and invitations sent out. The Emperor Commodus, a spoiled brat who deserved to be assassinated. Still, two wrongs rarely make a right, and it was a further step in the degradation of Roman government. nobody has been eliminated except for the two who were eliminated in the previous score update. Iron Maid is really tearing up the scoreboard! Last edited by Dukasaur on Sun Dec 23, 2012 6:05 pm, edited 1 time in total. Week 5 games have been created and invitations sent out. Dukasaur wrote: Iron Maid is really tearing up the scoreboard! Week Six games have been created and invitations sent out. It is blatantly biased, and yet very readable. I won Game 12116386 That must take me up in the stats. =) GG all that were in it.